At about $25 million per acre, DAG President Shahin Alizadeh said his group started looking at options for a dealership, including condos. 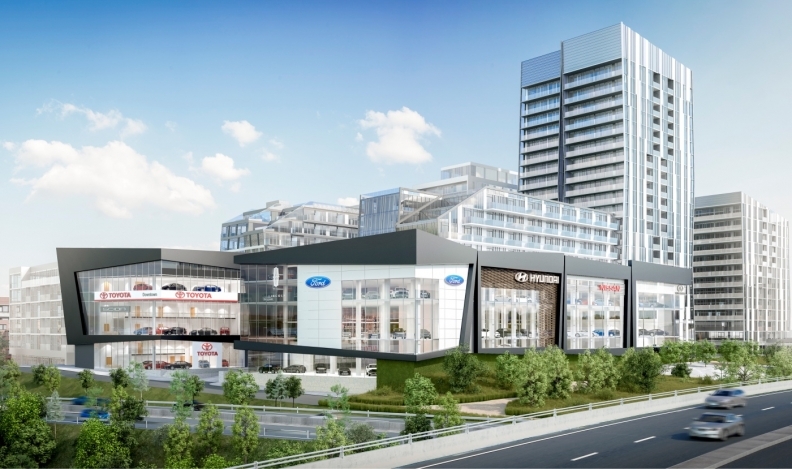 TORONTO — A Toronto dealership group is taking business diversification to new heights — literally — by partnering with a local real-estate developer to build a multi-brand auto mall complete with 900 condos and "lots of retail." Several years ago, the Downtown Auto Group bought a five-acre (two-hectare) parcel of land near Toronto’s Don Valley Parkway where it crosses over Queen Street East, with the intent to build a traditional auto mall there. But something happened in the interim: Toronto real estate prices soared. "At $20-25 million per acre, the current market price for land in this area, it quickly became clear that the financial model of the traditional auto dealership wouldn’t make sense for this property," said DAG President Shahin Alizadeh. "So, we started looking at options." With condos selling in Toronto for $750 per square foot, such a development seemed the obvious use for such an expensive parcel of land. But then, said Alizadeh, "where would the auto mall go?" DAG considered several options, like parceling the land, and scaling down the auto mall, but none felt like the optimum solution. 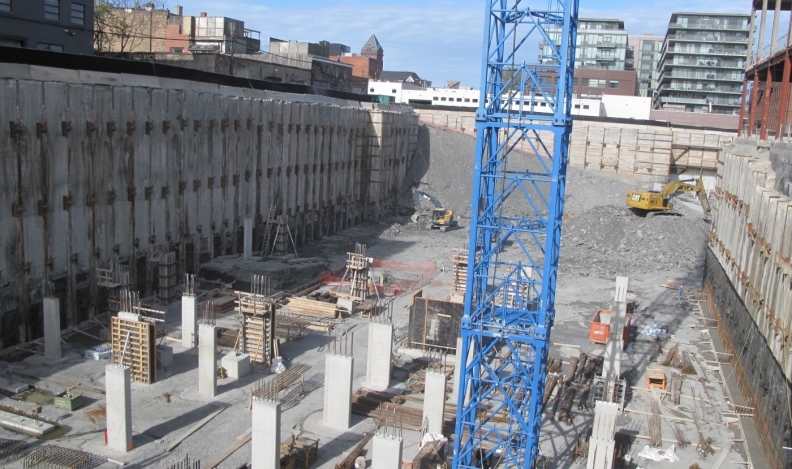 Then Alizadeh had a fateful meeting with Les Mallins, the driving force behind Streetcar Developments, a company with several successful condo and retail projects under its belt in the area, including the award-winning restoration of the historic Broadview Hotel. Mallins proposed that Streetcar co-develop the project with DAG. 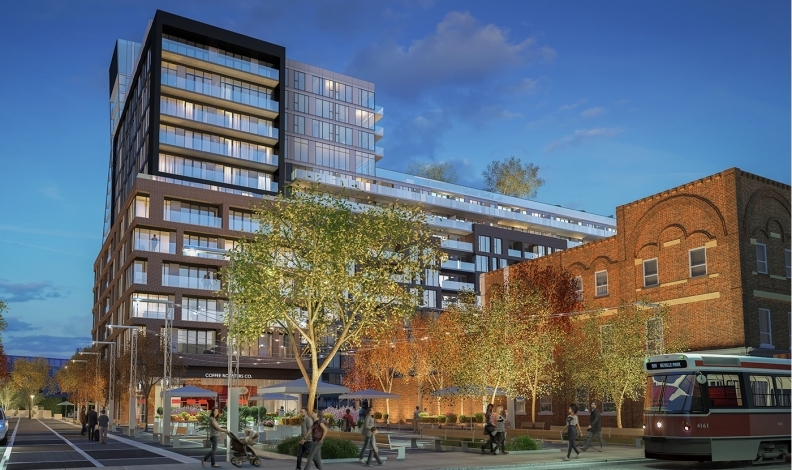 Net result: The DAG Autoplex will be incorporated into a residential development called Riverside Square, with 900 condominiums, a public square and retail — including seven DAG dealerships — all built on the same site. The condos will be set back and above the dealerships, which will be on street level. The dealerships are nontraditional in layout and size. Construction began this spring, and Alizadeh said the project is “on target” for its planned opening in the summer of 2018. The project’s pre-construction phase was considerably longer, with more plot twists. “About two years ago, we (finally) got buy-in from all the participants,” said Alizadeh. The city was not among the dissenting voices. DAG owns 10 dealerships, seven which – Toyota, Hyundai, Genesis, Nissan, Infiniti, Ford and Lincoln – are moving into the new autoplex. DAG’s newly opened Genesis dealership is in a rental property and will move into the autoplex when construction is complete. Downtown Lexus is also part of DAG, but will stay in its current and nearly new facility on nearby Dundas Street. Avenue Nissan and Toyota on Front, both on the other side of downtown, will stay put. Naturally, there was some concern expressed by local residents; the word “autoplex” rarely invokes warm and fuzzy feelings among urban dwellers. One resident filed a complaint with the city ombudsman, but the ombudsman eventually ruled in DAG’s favour. According to Alizadeh, the automakers were the group that had the most questions and needed the most time to accept the “nontraditional” aspect of the project. The autoplex will have a common entrance and common parking for all the customers of the various stores. A valet service will ensure customers know where to go, and that their vehicles are parked and correctly received. Alizadeh said that automakers had concerns about maintaining their brand images with those and other common elements. He adds that they came to realize, as DAG did some time ago, that traditional dealerships have to evolve to meet new urban realities. “They also recognized the value of the community we were building around the dealerships. We’re build- ing a community, 900 condos, along- side seven car brands. “I can’t see anyone actually saying this is not good for the car business."